PDC Windows Vista is better than its reputation, but its reputation is pretty bad. During the press briefing for Windows 7 at Microsoft's Professional Developers Conference (PDC), corporate vice president for Windows product management Mike Nash insisted Microsoft had learned from the Vista experience. Judging by early Windows 7 code released at PDC, the signs are that it really has. Microsoft is making all the right noises: everything that works on Vista will also work on Windows 7, it will be faster on the same hardware, it will run longer on the same batteries, it will be more reliable. In other words, whereas Vista was two steps forward and one step back from Windows XP, there should be no downside to Windows 7 over Windows Vista. A day spent with a Windows 7 preview build - Milestone 3, running on a laptop loaned for the purpose (Dell XPS M1330, Core 2 Duo 2.3Ghz, with 3GB RAM) tends to confirm that view. Windows 7 feels more polished than Vista, even in the preview, and performance is good. Unfortunately many of the new features in Windows 7 are absent from the build given to the press, presumably because they are not yet stable, so the following quick tour is partly based on first-hand experience, and partly on Microsoft's demos. The first thing you notice is the revamped taskbar, with chunky thumbnail icons, full-screen application preview on mouse hover, and "jump lists" - pop-up menus that expose key features directly from the taskbar, provided that the application was coded to support them, and recently opened documents for any application. The system tray area now has a customize option that allows the user to suppress notifications, annoying for developers but empowering for users. It is all about making Windows quieter and less annoying. The same principle is at play in the revised User Account Control (UAC), which offers a simple slider bar that lets the user decide the level of prompting it enforces. 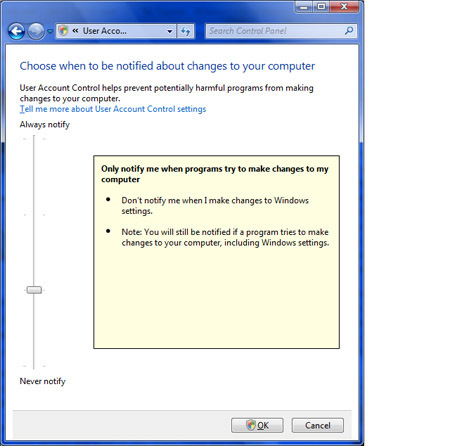 Microsoft has also tried to improve the experience of managing open windows. You can make windows temporarily transparent, in order to see files on the desktop, and when you drag them to a screen border, they snap into place. Vista's sidebar has been scrapped, and gadgets now appear on the desktop itself. Windows Explorer has a new feature called Libraries, where a library is a group of folders which you can search as if it were one location. Those few who have a multi-touch display can control Windows 7 with their fingers. Gestures like flicks and pinches perform actions like scrolling and zoom. Although this looked good in the demos, it was also apparent that many icons are too small to work well with finger control, including the close and maximize gadgets on every window.